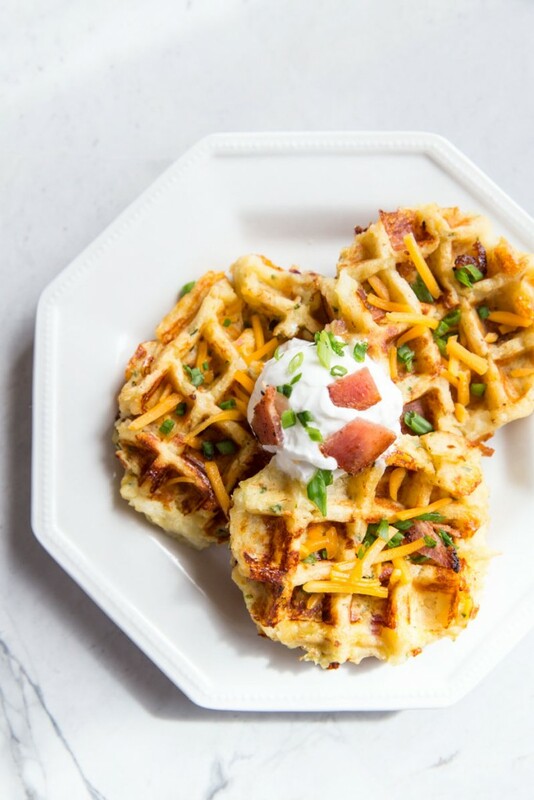 These Loaded Baked Potato Waffles not only tastes amazing but they are a super fun meal to serve to your family and friends. Make them as a side dish for a larger group or as a fun dinner for your family. We like to make breakfast for dinner on Sundays and sometimes make these topped with an egg! A few years back I tried my own hand at potato waffles using some leftover mashed potatoes and thinking it would be easy enough, right. 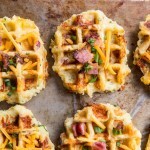 Well wrong… the fun looking photos I’d seen of other foodie friends using their waffle iron to create these savory potato waffles turned out to not be as easy as I’d assumed. A few recipes later and after much experimenting I’ve landed on a fail-proof way. Make sure your waffle iron is HOT and on the highest (crispy setting). Use russet potatoes (they tend to be the driest potato) and squeeze dry the shredded potatoes after you’ve baked and grated them with a cheese grater to make sure they don’t have any moisture. Adding flour to the batter also helps to make the potato mixture dry. 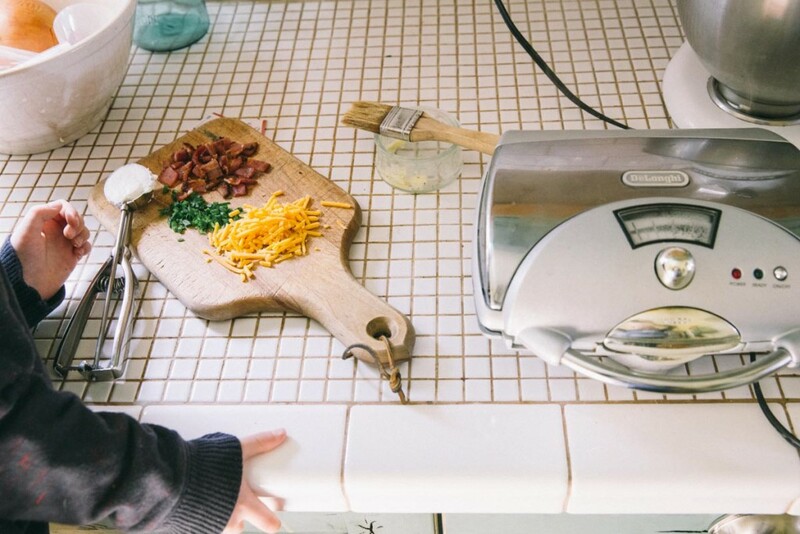 You may need to leave them in the waffle iron a minute or two past the beep depending on your waffle iron so slowly and carefully check them when you’re opening up the waffle maker. If they are not yet ready the waffles will often break or split. Use butter or a good cooking spray to grease the waffle maker between ever addition of batter so that the potatoes don’t stick. 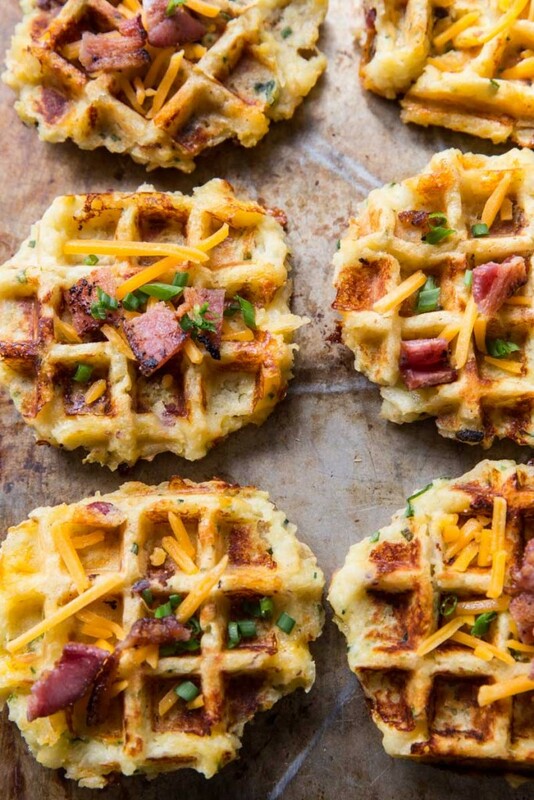 Keep the cooked potato waffles in a warm oven to further crisp them up and keep them warm until they are all cooked. Hope this meal is as fun for you as it is at our house! 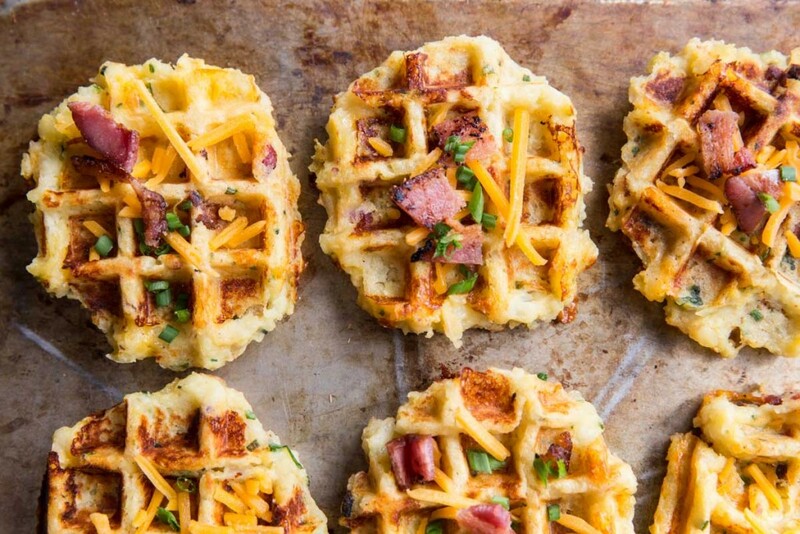 Try Baked Potato Waffles for a fun alternative to loaded baked potatoes. Heat your waffle iron and preheat the oven to 200 degrees. Once the baked potatoes are cool enough to handle, remove the skins then use a cheese grater (the larger holes work best) to coarsely grate the potatoes. In a large bowl, mix the grated potatoes with the eggs, flour, salt, baking powder, 3/4 cup of cheese and 3 tablespoons of butter. Fold in the 1/3 cup of bacon and the 2 tablespoons of chives. Brush the waffle iron with melted butter and spread about 1/3 cup of the potato mixture onto it. Close and cook on high until the waffle is golden and crisp, about 5 to 7 minutes (this is 1-2 minutes after my waffle iron already beeped). Transfer to a rack in the oven to keep warm. Repeat with the remaining potato mixture. 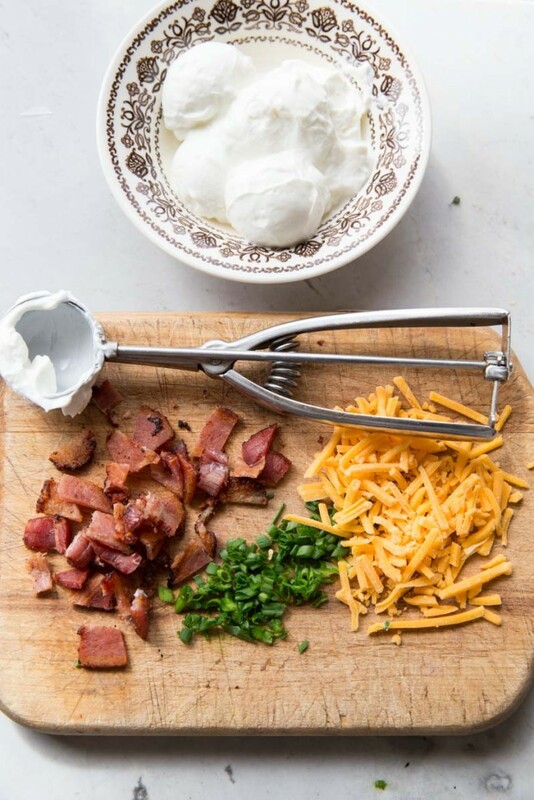 Serve the waffles topped with greek yogurt, along with the extra crumbled bacon, cheddar and chopped chives. If the potatoes fall apart when you try and open the waffle iron then they need to be cooked longer. Carefully use a fork to remove the waffles from the waffle iron without breaking them. They will continue to crisp up in the oven.